Space between the teeth is a problem encountered by many and the cause of it varies from one person to the other. In children, space between their milk teeth is that they save space for the permanent teeth and guide them into position, so parents do not need to panic as it is a natural process. Space between the upper front teeth is due to the low frenal attachment, the frenum attaches the upper lip to the upper portion of the gum. If the frenum is attached at low level in the gum line, it causes a gap known as a diastema. Gaps can occur between any two teeth. We may counter an unusual space between the teeth, if you come across such a gap then suspect for a gum disease. It is the plaque that plays a major role in causing this gum disease. The inner layers of the gums are pulled away from the teeth leading small gaps between the teeth. A mismatch between the jaw size and teeth size can also cause spacing. When the size of the jaw is big and the teeth are too small, it leads to spacing. Frequent use of tooth picks can also damage the gums causing space between teeth. Some drugs that may stimulate the growth of granulation tissue in the gums may cause tooth movement leading to space. 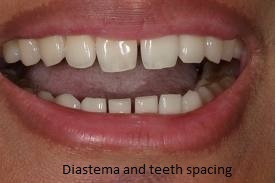 A diastema can be closed by undergoing orthodontic treatment or by placing thin pieces of porcelain bonded to the outside of the teeth or ceramic crowns. Spacing caused due to gum disease can be closed by treating the gum disease itself. Proper maintenance of oral hygiene, including vitamin C rich foods in your diet helps in healing the gums. Avoid frequent use of toothpicks especially the wooden tooth picks that are very harsh to the gums.